tinental manufacturers, particularly those operating in Germany, have long been interested in independent springing as a solution of the suspension problem of the small car, one of the best known and oldest established being that of the Adlerwerke Company, whose works are situated at Frankfort. Front-wheel drive was another interesting feature of the car tested and, as may be supposed, we took over the car with our powers of criticism and observation, as we hoped, at full bent. Heavy rain was falling on the day appointed for the test, while the front tyres we noticed were worn almost smooth. 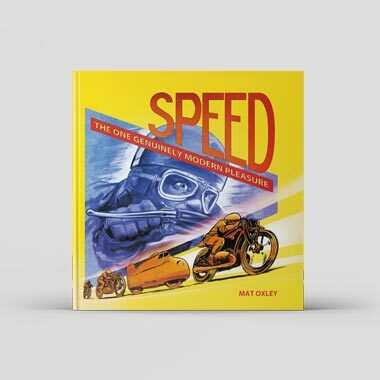 In spite of this, there were no signs of instability or wheel-spin even on greasy wood-blocks and, by the time we had gained the open country, felt perfectly at home and happy at the helm of the neat little two-seater. The first question asked by the prospective purchaser would be, how does the handling of the Adler, with its frontwheel drive, compare with a car of similar type fitted with orthodox transmission ? On a straight road, one can scarcely detect any difference ; the pulling power of the front wheels seems to take the place of the caster action which is relied to keep the rear-wheel-drive vehicle straight on its course, and the car holds a steady path at speed without any effort on the driver's part. There is no detectable alteration in feeling, even when the accelerator is suddenly released. On a corner; the pulling power of the wheels again takes the place of caster and helps to straighten up the front wheels and, actually, a certain effort is required to resist this effect, an effort only noticed however in comparison with the lightness of the steering in normal travel. Dimensions : Wheelbase 9 ft. 3 in. Track 4 ft. 1 in. Price : Open two-seater MU. no transmission line to bother about, the engine and passengers are carried low between the side members, which helps on corners. 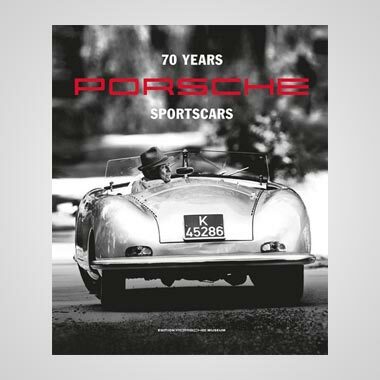 The suspension provided good insulation against rough roads, but has not been made too supple and the car has that firm feeling on bends which the sports-car driver values so much. 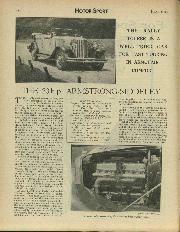 Being intended primarily for longdistance work, rally driving and the like, the Adler is purposely tuned for highspeed reliability rather than maximum speed, the highest speed we reached on the level being 67 m.p.h. We were informed by the Distributors that the same car had previously been capable of reaching something like 75 m.p.h., so possibly excessive carbon or retarded ignition may have been to blame. 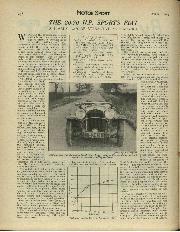 The important point is that the car runs quite happily at 55-60 m.p.h., or even with the accelerator hard on the floor-boards, for an unlimited period and, as the car is preeminently well-sprung, roomy and comfortable, excellent average speeds may be put up. The brakes lire powerful, and even on a wet road, Ar pulled up in 63 feet from 43 m.p.h. Considerable pedal pressure is needed to get the full effect, a factor which makes for safety on slippery surfaces. day's practice, this method of selecting the gears offers no difficulty, but the change is made rather heavy by having stiff selector springs and a strong spring pulling the lever towards the lower position. clearance for the propeller shaft and hack-axle, the chassis side-members are straight for their entire length, and of box-section. They converge towards the front to permit an exceptionally .good steering lock, and at the rear are braced by light and simple cross-members. The underside of the car is quite smooth and the ground-clearance is iq inches. 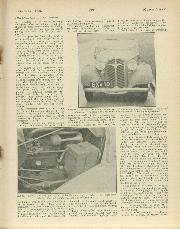 The open two-seater body fitted to the car we drove reached a standard both of comfort and appearance, and was obviously constructed to withstand hard elbow-room with the hood and sideusage. It was wide enough to give full curtains erected, and the screen, which could be folded flat down was deep enough for the tallest driver. 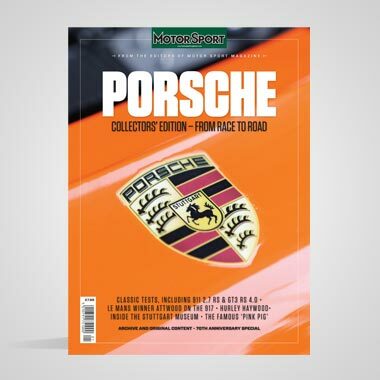 There is plenty of room round the pedals, since there is no rear-mounted gear-box to come back into the driving compartment, and with the floor-boards slung well below the side-members, the driver sits commendably upright in the best position for fast driving. 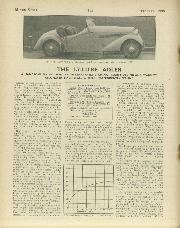 The squab was adjustable for rake, and a thin-rimmed Ashby steering wheel was fitted to the car we deove. The hand-brake is mounted on the left of the driver. Being purely a two-seater, all the space under the sloping rear panel of the Adler is available as a luggage locker, capable of taking four large suit-cases and other travel gear. Tools are carried in a COM, partmerit under the seats. The hood has the double-folding mechanism beloved of Continental manufacturers, but is easily erected when one gets the knack of it. The spare wheel is recessed into a well in the rear panel. 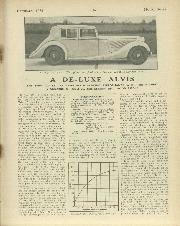 The car tested was put at our disposal through the courtesy of Messrs. British Adler Cars of 9, Albemarle Street, London, W.1. 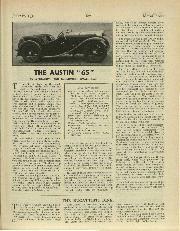 Apart from their activities as sole concessionaires of Adler cars for England, their intention is to enter cars for long-distance competitions such as the R.A.C. Rally, in which freedom from trouble, easy running, and maintenance of tune can be demonstrated. 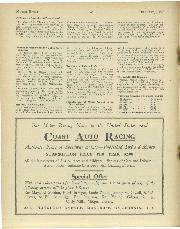 Unfortunately there are no really long-distance high-speed events in this country corresponding to the 2,000-Kilometre Trial in Germany or the Alpine Trial, in which Adlers have been conspicuously successful, but at any rate the " resistance "
demonstrated there will be of value to owners in this country. 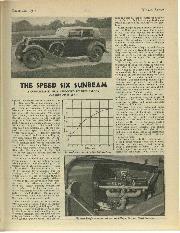 Another convincing demonstration of the ability of the 1k-litre model to stand up to hard work was given by the streamlined saloon which averaged nearly 77 m.p.h. for four dayron the Avus track late last year.